During the 2007 FUN Show in Orlando, the Smithsonian's National Numismatic Collection (NNC) presented an exhibit of patterns and sketches created by Charles Barber. The purpose of the exhibit was to both display the original sketches and patterns themselves, and also to educate the public about how design ideas evolve through the process of becoming coins. According to NNC Curator Jim Hughes, these patterns have never before been on public display. Several of these patterns are extremely rare, and despite some of them being pictured in publications over the years, this was the first time the public has had an opportunity to see the actual items themselves. The most notable items on display were the 1891 Barber Half Patterns -- just two are known (both in the NNC) and both patterns were exhibited, giving views of both the obverse and reverse. The 1891 Pattern Half Dollar featured the same design as adopted for the regular issue the following year, but the original reverse featured a smaller eagle enclosed within a wreath, with clouds among the stars above the eagle. The regular issue featured the large eagle, no wreath, and no clouds. 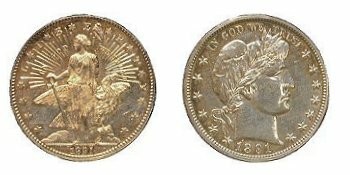 Another exceedingly rare pattern was the 1891 design with a standing Columbia with a liberty cap, along with rays and an eagle on the obverse. Other patterns on display included five pattern nickels, most notably the popular 1882 Liberty Nickel, which bore the design adopted the following year for the production issue. Some of the other nickel patterns included commemorative issues featuring George Washington, and also a shield with a Liberty ribbon. The popular Columbian Half (which became a real coin) was also featured. Original Barber sketches of the McKinley Birthplace commemorative dollar, and an 1899 Columbian pattern Peso for Puerto Rico rounded out the exhibit. All in all, the exhibit provided the general public with some insights into the process of creating designs for potential use in our country's coinage, some of which end up being adopted, and some which are not. But for Barber collectors, it was the first time we were actually able to lay our eyes on some of the very rare patterns which resulted in the series that we collect today. Click on the thumbnails below to see a larger image. All photos taken through exhibit glass.